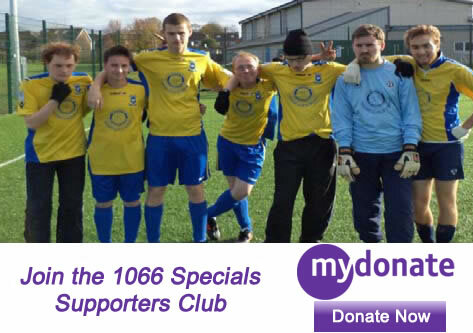 The 1066 Specials offer a wonderful environment where everyone can enjoy ‘the beautiful game’. Many of the players here have developed better social skills and had their confidence boosted due to their membership of the club. As well as improving their football abilities, members and their families form a strong bond and develop close friendships. This allows the club to have a real family atmosphere – and new members will always be given a warm welcome. We look forward to meeting you at some point in the future. Usually the first, second and last Saturdays of every month. Please note that anyone using the coach to travel to tournaments will have to pay £1; this includes players, carers, parents, committee members and coaches. Please get in touch if you would like to find our more about our club or would like to get involved.